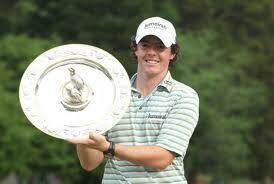 Rory McIlroy from Northern Ireland win his first major golf title with an eight-stroke triumph. The 22-year-old Irish prodigy on Sunday fired a two-under par 69 to finish 72 holes at Congressional Country Club on 16-under par 268. His overall score of 16-under 268 shattered the U.S. Open record, held by Jack Nicklaus, Tiger Woods and two others, by four strokes. McIlroy became the youngest major winner since Woods at the 1997 Masters and the youngest US Open winner since Bobby Jones in 1923. The two greatest players in the game knew what they had seen. Tiger Woods said, “What a performance from start to finish.” Nicklaus, who had been mentoring McIlroy over the past several months, was equally impressed. McIlroy, who jumps from eighth to fourth in the world rankings, became the 11th different winner in the past 11 majors and the eighth first-time major champion among the past nine major winners.